After discussing W sitting with an Occupational Therapist, Becky, the next questions I had for her were regarding E's unique pencil grip. I sent her this picture with my inquiries. From my own research, I was hypothesizing this was an interdigital brace grasp. It is also sometimes called an adapted fisted grip. You can see here how she wrote with a fist grasp a year ago. I let Becky know that we work on fine motor skills daily and asked if I should correct the grasp. "Based on the fact that she w-sits, my thoughts are that she is doing this as she feels she has better control of the writing utensil. 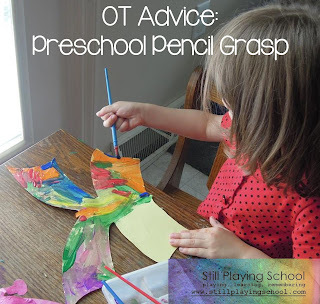 Many believe that grasp will continue to develop naturally (unless there are significant fine motor concerns) and as long as you are increasing the strength of her hand through fine motor tasks, you do not have to specifically correct the grasp." "My concern with that philosophy is that I have seen adults using the same grasp. Sometimes as we learn to write in a position that becomes comfortable to us, we continue using it long past the point of it being necessary." Oh, this could very well be the case with my girl. As is evident from the pictures that I post of her writing on our Facebook page, she has a pencil or marker in her hand at least a third of the time that she's awake. This habit is going to be deeply engrained as a habit by the time her fine motor skills catch up to her passion for writing. "I would encourage her to try writing holding the utensil with her fingertips and see how successful she is. 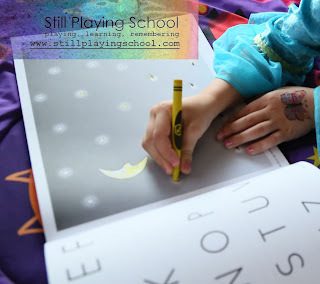 I would focus fine motor activities to ones that will specifically strengthen her fingers (as you obviously continue working on activities for the hand, wrist, shoulder, etc.). There are many ways to do this but think of things that she can do to squeeze her finger tips together - making indentations in play-doh, using tweezers (depending on her ability) to transfer items, etc. 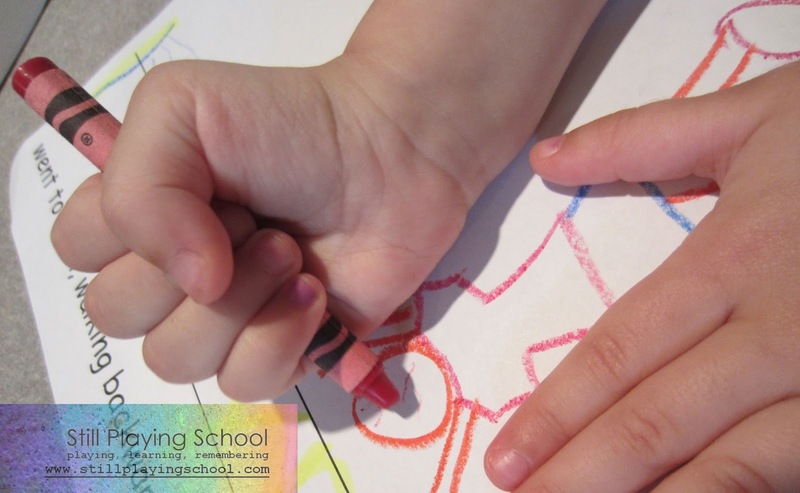 The other idea I have quickly is to give her very small pieces of broken crayons or chalk that she can only hold in her fingertips (she would hold them at the top) to become more comfortable writing without the support of her whole palm. Start with simple designs and move to more difficult things like letters (I saw she is already writing her name!)" These are all really great ideas from Becky. I've implemented most of them since reading her response! 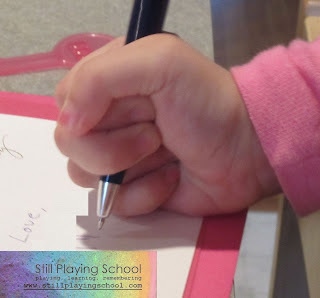 I've collected pencil grip recommendations from readers and friends that I'll try out with E. We're continuing on with Handwriting Without Tears during our home school preschool which should help. I plan to talk to her traditional non-homeschool preschool teachers about this ongoing struggle so I'll update you about her progress in a few months! I'll be writing a future post about all we've tried out to strengthen her hand muscles. Until she develops the fine motor skills she needs, I've been trying to gently remind her to pinch the pencil point with little success. She will write that way for a minute, then revert back to her inefficient grasp. The other day after a reminder from me, E begged, "Please, Momma, can I just write my way?" It truly broke my heart as I don't want to stamp out her love for writing. Do you have any advice regarding correcting non-developmental pencil grasps that has worked for you or your children?